Home » Featured » News & Updates » Book Your Spring Break 2014 Trip to Panama City Beach Direct! Book Your Spring Break 2014 Trip to Panama City Beach Direct! PCBeachSpringBreak.com is Your Gateway to a Successful Spring Break! Spring Break 2014 in Panama City Beach, Florida is mere months away, and so, if you and your friends haven’t booked your room(s) yet (or worse, haven’t even thought of where you might stay), you really do need to get a move on. Not that we’re trying to rush you or anything, but if you’re planning on taking advantage of some great discounts currently being offered by hotels and condos right on the beach, then now is the time! Before we go any further, let’s clear something up – we’re not travel agents and we’re not trying to sell you something out of desperation. Rather, we here at PCBeachSpringBreak.com are an online source of information for students who would like to learn more about Spring Break and discover what’s available to do in Panama City Beach, Florida – the ‘Spring Break Capital of the World’. Need to know what hotels are available and at what cost? Our site gives visitors full access to only the very best hotels and condos available on the beach on our “Where to Stay” page. From there one can make an informed decision and can book directly with the hotel or condo of their choice. As we all know, the internet has come a long way. The benefits of booking hotels online are steadily increasing. Most, if not all, hotels have developed their own branded websites and online booking agents which allow potential customers to save big dollars by avoiding a third party agent. In the past, students wanting to book their own getaway had to endure a slow and tedious process while searching out and eventually booking their hotel. The online channel is now much faster and efficient as all the information about the hotels, their facilities, rooms, location and images are readily available for viewing on their very own websites. Furthermore, feedback and reviews can be exchanged with ease on these websites, as well as on source forums such as our very own PCBeachSpringBreak.com. Another benefit that students booking their hotels online stand to gain is the ability to make last minute reservations in a convenient manner, and as a result, enjoy the price rebates that hotels may implement to fill up these rooms, equaling even more savings to the customer. So, as one can tell, booking direct is very much a positive and beneficial luxury. Our website opens up a gateway that can lead visitors to understanding what’s available, and more importantly, that we’re not necessarily biased to a particular brand. We encourage you to investigate for yourselves because the decision making power is at the click of your own mouse button, not ours. For more information and to learn more about the variety of hotels and condos we recommend for Spring Break 2014, please visit our Where to Stay page. 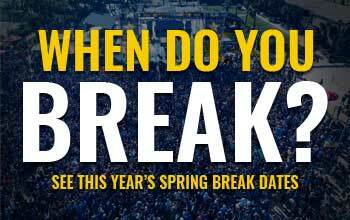 And make sure that you’re following our Facebook and Twitter profiles for all the up-to-date news and promotions, including Free Spring Break 2014 trip giveaways.